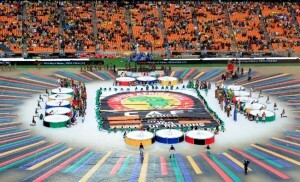 The opening ceremony of the 2013 African Cup of Nations, 19 January, 2013 in Johannesburg, South Africa. President Jacob Zuma has said that South Africa will not let down Africa in hosting the Africa Cup of Nations (AFCON). “As all of us know, the country which had made a successful bid to host the 2013 Afcon was Libya. But because of the political situation that prevailed for most of last year the Confederation of African Football decided to move it to this country,” Zuma said. Zuma was addressing heads of state attending the tournament in Sandton, Johannesburg. He said the preparations put in place for the 2010 World Cup had eased the burden for South Africa. Zuma welcomed all the heads of state and fans to explore South Africa between games. “I trust that you will be treated to the best soccer spectacle humanly possible, starting from this afternoon’s opening game. “May this be yet another memorable event for all of you… and may the best team win this afternoon, and obviously in my view, that should be my national squad, Bafana Bafana,” Zuma said.